UC Santa Cruz is committed to a safe, supportive learning and working environment for all members of the campus community. Campus safety is our top priority, and we take all threats of violence seriously to protect everyone’s health and well-being. 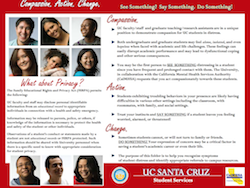 Preventing violence on campus depends on UCSC community members identifying and communicating behaviors of concern—early identification of concerns allows administrators and staff to provide resources to students in distress to minimize harm to self or others. You can help by being aware of your surroundings on campus and reporting any unusual activity from people. We are all responsible for safety. If you see something, say and do something about it—report any concerning behavior and suspicious activity. If you are concerned about the immediate health and safety of the student or in life-threatening situations, call 911 or campus police (831-459-2231). 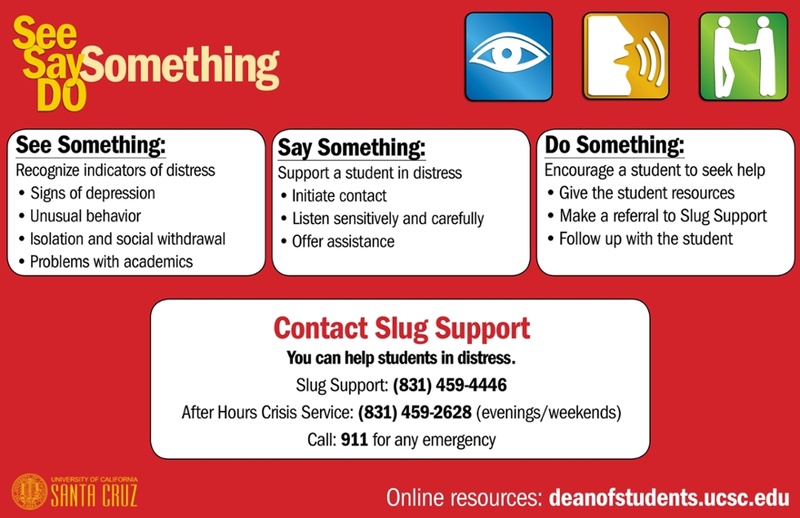 Call the Slug Support Program line (831-459-4446) to report unusual behavior, consult about distressed students, or make a referral. Contact Counseling & Psychological Services (831-459-2628) to refer a student for services or consult with professionals about students’ mental health concerns. There is an after-hours service available at night and on weekends for crisis assessment, consultation, and intervention. Use other campus resources for student referrals and consultations or call another contact for help.